Our students are ready to start work the minute they graduate because of the time they spend in industry. All our Engineering and Forestry Science students gain experience in the professional world through practical work placements as part of their degree. Students learn how to apply the technical skills they have studied in class to practical, real-world situations over 90–100 days of work in various organisations. Their time in the field helps them to develop skills such as communication, teamwork and leadership. To familiarise you with engineering tools, equipment, machines and techniques. To help you understand the engineering terms and concepts introduced during the degree course. To provide you with actual experience of different work roles that you are likely to encounter once you are a professional engineer in work. A minimum 800 hours (100 days) practical industry experience. Two written reports on work experience. Work experience is completed after the First Professional Year of study. In exceptional situations, once a student has enrolled in the First Professional Year, they may apply to be exempt from the work requirements based on previous experience. These requirements are the responsibility of the student. The College of Engineering does not place students into work experience but may suggest companies to approach. See Practical Work Experience for details, forms and resources as well as information on first aid and guidelines on report writing. UC hosts clubs such as the Engineering Students Society (ENSOC), Women in Engineering (WIE) and the Forestry Students Society (FORSOC). These clubs engage with industry members throughout the year by running careers fairs, networking events, interview prep sessions, guest speaker evenings, and quiz nights. UC Careers runs employer information sessions and careers fairs to connect students with industry. Our students undertake a final-year project, often industry-based, in their area of interest. While working on a real-world problem, students will be learning all the competencies they will need to practice as a professional after graduation. Recent projects span sport, energy, manufacturing, environmental, and healthcare fields. Final year projects allow for a more independent investigation into a topic. Students identify and define a problem and research existing relevant knowledge. Projects can include an oral presentation, poster presentation and submission of a written report. A showcase of final year projects is held each year in October. The showcase is open to the public and we strongly recommend that anyone considering studying the BE(Hons) comes along to see the variety of work our students are involved in. 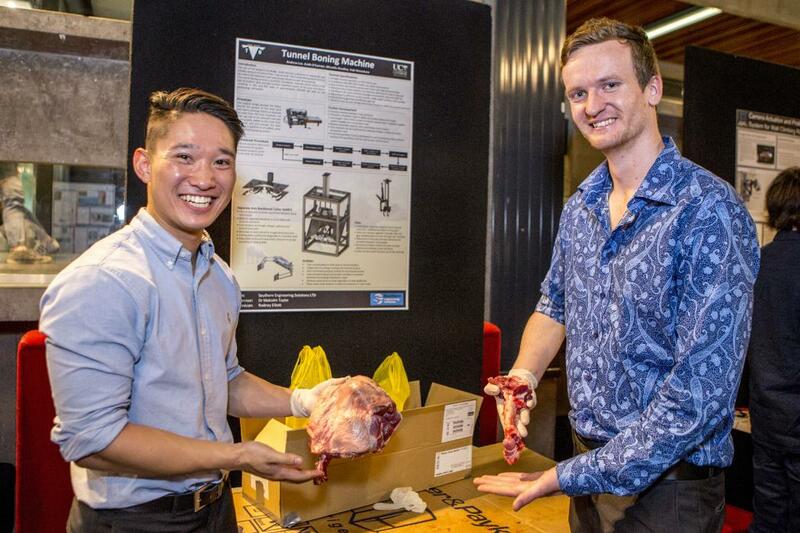 Pictured below are Mechanical Engineering students Yuki Shimahara and Keith O’Connor with their 2016 final year BE(Hons) project. The pair built a tunnel boning machine and their project was sponsored by Southern Engineering Solutions.